Trax Express Systems is a successful, long established independent courier/parcel delivery company with over 100 years combined management experience from within the industry. Strategically located close to Birmingham City Centre, we operate a fleet of modern vehicles with a comprehensive range of services to satisfy the logistical needs of any company. We transport anything - documents to pallets - for same day or overnight delivery. We also export goods to Europe and Worldwide at extremely competitive rates. In conjunction with APC Overnight which boasts 115 delivery and collection depots nationwide and more than 2000 vehicles - far more than any other overnight parcel company - our service is unrivalled. Our philosophy is to treat every delivery as if it were same day, which is why our service remains streets ahead in terms of performance, flexibility, quality and attitude. 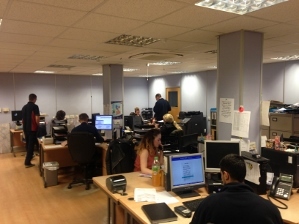 Our experienced staff are all based in Birmingham and are dedicated to customer care. Large, blue-chip companies, sole traders, leading accountancy and solicitor practices across the city are unanimous in their praise for the friendly, personal and proactive approach they get from our team.